Source: CICH graphic created using data adapted from Canadian Mortgage and Housing Corporation (CMHC). Canadian Housing Observer. 2014. https://www03.cmhc-schl.gc.ca/catalog/productDetail.cfm?cat=122&itm=27&lang=en&sid=VmCK5s3IQeh7csfer7SAOEz0JlbSVBy4eQ9xoJylGMouMt0jGpMezrCPQsFSnk3e&fr=1528668487548 – accessed March 20, 2017. 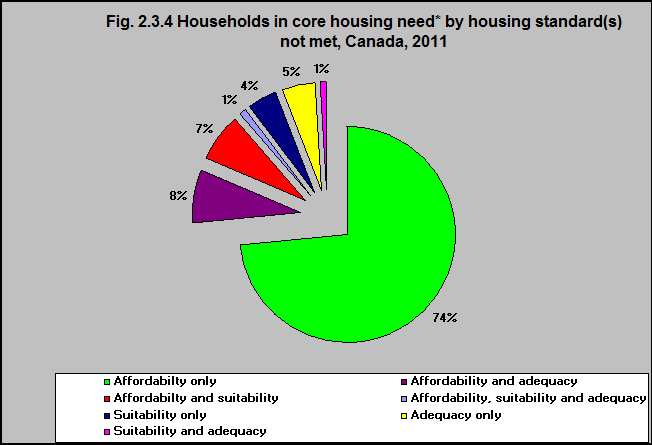 In 2011, 90% of households in core housing need had an affordability problem.